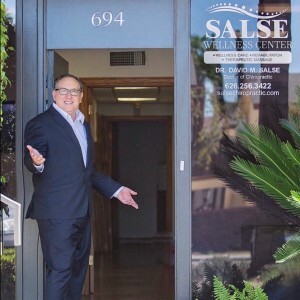 In 1993, Dr. David M. Salse, D.C. began his practice in the Monrovia area. Dr. Salse is respected and well-known throughout the San Gabriel Valley. You’ll find his office near the foothills in beautiful Monrovia . We offer five-star wellness to our community! Our purpose is to help as many people as possible live better lives through natural chiropractic. When you visit us for your health care needs, we’ll work with you to meet your healthcare needs. You’ll learn how regular chiropractic care can help you maintain a high level of health well into your later years. In fact, many of our senior patients use chiropractic to keep up with their active lifestyle. We’ll talk to you about how the nerves in your body are all connected to your spine, and therefore by addressing the alignment of the spine, we’ll affect the overall health of your entire body. Our VIP Wellness Program is the answer to rising healthcare costs. Our program provides the benefits of membership with a reduced fee without long contracts, and we accept all credit card payments. Contact us today to find out more!